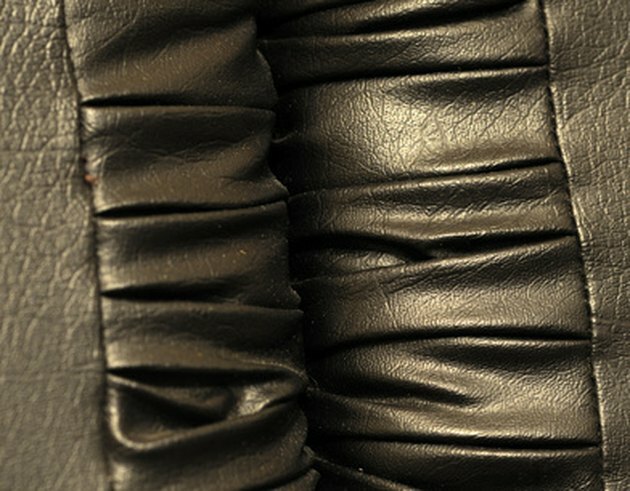 Pleather, a term given to faux leather, is used to make items such as jackets, vests, skirts and even furniture coverings. Many people buy pleather rather than leather because it is more affordable and easier to clean and maintain. Pleather can take on some unpleasant smells. Some odor-causing culprits include smoke and certain foods. You can remove these foul smells with the proper tools and techniques. Combine the white vinegar, laundry detergent and 1 qt. warm water in a bucket. Launder the pleather if possible. Some clothing items made of pleather can be washed. Check the label for cleaning instructions. If you can put the pleather item in the washing machine, add 1 cup of vinegar to your laundry detergent to remove any odors.